The New Zealand government recently passed a motion calling for “genuine media freedom in West Papua”. 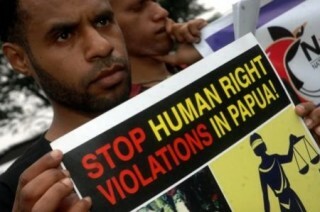 Sadly, on 6th August two French journalists, Thomas Dandois and Valentine Bourrat, who were reporting on the growing human rights crisis in the Lanny Jaya region of West Papua were arrested and are being threatened with a 5 year jail sentence and a 40,000 US dollar fine just for reporting in West Papua. These events have sparked a new international call for media freedom in West Papua. Please support this movement by writing to your elected representative to request your government to join New Zealand in calling on Indonesia to allow full freedom for local and international journalists to report on the political situation in West Papua. A model letter for you to send to your elected representative follows. We would be very grateful to hear of any response that you get from your government. I am writing to you as my political representative to please urge the government to push for access for international journalists to West Papua, which has been illegally occupied by Indonesia since 1963. West Papua was previously a Dutch colony but was handed over to Indonesia in the 1960s without the consultation of the indigenous people and entirely against their will. The West Papuan people have been denied their fundamental rights to self-determination and independence ever since and are struggling for these rights to this day against an increasingly brutal Indonesian military who have killed an estimated 500,000 indigenous Papuans. In an attempt to cover up the human rights atrocities, the genocide and the occupation; the Indonesian government still bans foreign journalists from reporting in West Papua and with the threat of violence restricts even local journalists from documenting the independence struggle. The people of West Papua desperately need international journalist access and media freedom in their country so that the outside world will be able to take notice of the human rights violations happening there. This will allow the international community to act to prevent such violence against the West Papuan people in the future and allow them their human rights including their long overdue right to self-determination. Thankfully, on 30th July this year, the New Zealand Parliament passed an historic motion, moving that “the House call upon the new President of Indonesia to commit to genuine media freedom in West Papua including the right of local and international journalists to report on the political situation there without risk of imprisonment or harassment by the Indonesian state.” The motion was passed with no opposition and is a major landmark on the road to journalists’ access to West Papua. With more governments supporting such essential media freedom, the more likely Indonesia is to finally open the sealed doors in West Papua and let the world find out about the real situation there. Unfortunately at the present the situation in West Papua itself is only getting worse. Very recently the Indonesian military began an operation in the Lanny Jaya region of West Papua in an attempt to exterminate pro-independence sentiment. Indonesian soldiers are currently burning villages, killing livestock and forcing thousands of villagers to flee into hiding in the jungle where they are suffering in poverty. On 6th August, two French journalists, Thomas Dandois and Valentine Bourrat who had been trying to document this emergency situation for French/German TV Channel Arte, were arrested by the Indonesian police. They are being threatened with a 5 year jail sentence and a 40,000 US dollar fine simply because they were journalists operating in West Papua. As my representative, I am calling on you to please urge the government to join New Zealand by calling upon the Indonesian government to allow full journalist access and media freedom in West Papua. Please ask the government to pressure the state of Indonesia to allow genuine media freedom so that journalists such as Thomas Dandois and Valentine Bourrat and the West Papuan people may freely report on the real and pressing situation in West Papua. It is my sincere hope that with such support the Indonesian government will finally let the truth be told and the world will act to allow the West Papuan people their fundamental human rights.